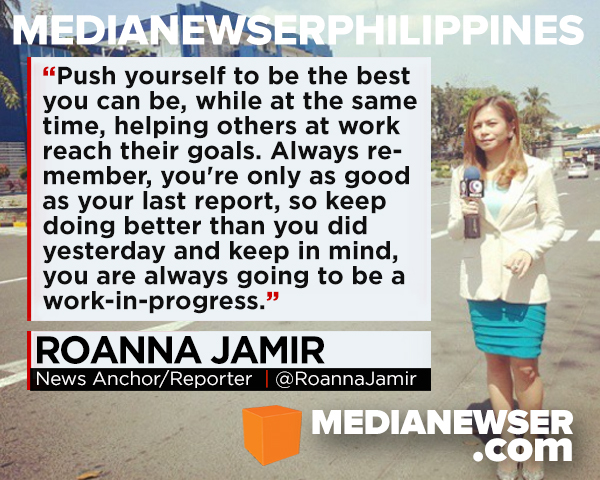 Since joining CNN Philippines full-time in March, Roanna Jamir has not only accustomed herself to the anchor chair, but she has also continuously challenged herself by taking every opportunity to go out in the field and look for stories. Now the anchor of Network News Weekend and the news bulletin CNN Philippines Updates, Jamir has also been filing human interest stories for the network. "There is enough news on corruption, war, death and destruction that I felt I could at least bring in the good of people," she says. "I want to showcase positive stories and remind audiences that in the midst of all the chaos, there is still much to rejoice in the world." A staple of FM radio, Jamir had her first foray into the world of TV news in 2012 after joining PTV4 as a reporter/writer/producer/director/editor. "I learned that being a content provider [at PTV4] with the responsibility of submitting 3-4 minute video reports in English and 3 in Filipino is definitely not easy," she says. "But it did help me understand that it can be done. I attended events to cover, filmed with a tripod, had to press the 'recording' button myself. Then I'd come home, look at the material, edit the video, voice it in Filipino and English and submit to the boss." Jamir recently spoke to Media Newser Philippines about her life and career, as well as her hopes for the future. Be sure to be part of the discussion by tweeting us @medianewserphil or posting your comments below or on our Facebook page. Guiding Principle: Never stop learning. Media Idols: Anna Coren, Richard Quest, Andrew Stevens, Ross McLaughlin, Kristie Lu Stout, Allen Shum, Maria Ressa. Tell our readers your story. Who is Roanna Jamir both on-cam and off-cam? I was born in the Philippines, left at the age of 9 for the Middle East. When I was 13, we vacationed in America, where I decided to stay behind to study for several years, staying with guardians as I was a minor. Went back to the Philippines a couple of years later and I’ve been here since. I'm a wife and mom of an energetic two-year-old. I love to travel and enjoy spending time with old friends and meeting new ones. I like watching movies, the arts and music. I write songs, poetry, draw and had a band for years before I got in the news industry. I’m an avid learner, one reason I've picked numerous hobbies along the way. I am continuously proving to myself that anything can be learned if you have enough passion for it. Off-camera, I am constantly researching, looking for interesting stories to tell. It's a lot of reading, making phone calls and scheduling filming dates. But sometimes, it's also about being able to persuade someone to tell their story. This is where it can be challenging, but I enjoy that challenge, provided I know the end result will only be for the betterment of the person I interviewed and for the audience as well. Then there's pitching of the stories, and believe me, sometimes it's difficult for people to see how a story can have impact when all you have is an idea. Pitching why your story needs to be told isn’t that easy. When there's breaking news stories, on the other hand, I am still always researching to learn more, this is how you can come up with really good questions to ask during interviews. In the studio it's a lot of preparation prior to the newscast. Most of the time, I end up just news reading, but in the instance there isn’t enough time to write a script on the prompter then I can still function because I’ve made ample preparation. On-camera, I read the news for CNN Philippines Updates Thursday and Friday mornings. Then I read the news top of the hour on weekends and finish the day with a 30-minute newscast called Network News Weekend. We have a full team who have set responsibilities, but for things within my scope of control, I prefer letting a conversation flow instead of reading a preset list of interview questions. I also try to read the news in a manner that sounds natural, as If I were just telling a story and not reading. Tell us about your career path. You've had quite a career on radio, why did you decide to jump to TV full-time? As we were to transition to CNN Philippine March this year, I was given the choice to join and be trained as a journalist. It was so surreal. I never imagined I would ever be faced with that option. I found myself very lucky to be given this choice. So, I quit my radio job and all other interests to be exclusive to CNN Philippines. Was I making the right decision? I didn't know. But there was only one way to find out, right? And so here I am. How do you like your post at Network News Weekend so far? I think it's truly an honor to have your own newscast that you can call your "own." I may not have full control of it, but at least I have more freedom to bring up some suggestions here and there on constantly improving the newscast. It's also great to think that I am able to impart what's been happening to people who might have been busy during the week to catch up with the latest news. Aside from anchoring NNW and Updates, you also regularly do field reports. Take us through your process of finding and reporting a story. Do you have your own criterion? I had much practice doing this after running my own radio show for 6 years. Having to come up with 2 hours of interesting and relevant things to say 5 days a week is not easy. So, after I've done my research, I think of a story. Who are the people it will show, what do they have to say, how will it be said and why should it be told? What's the significance? It's a very creative process, which I enjoy very much. Once you've decided what kind of report you want to file, now it's time to convince the network why it's an important story to invest time and money in. You won't get a crew unless your story pitch is approved. This alone can make it very challenging because all reporters are always pitching stories to sometimes the same person, and with human interest pieces, it may seem less urgent compared to all the other pressing issues. Once I have the approval, then comes scheduling a crew and the people to be interviewed. Now you're ready to shoot but how will it be done? So this part is where I talk to the cameraman and discuss the look I'd like for the report. We talk about camera angles and I review what has been filmed, before moving on to the next shot. Here you ask the important questions. So once I've filmed everything I need, I review my material by watching everything and taking down the shots I really like and transcribe selected parts of the interview. This is kind of like writing a micro movie. It must have a strong intro, or the audience will tune out immediately. It must have great angles, poetic phrases and impacting words by the interview subject. It's like visualizing a once flat jigsaw puzzle into a three-dimensional moving object. You submit your script to the copywriting head to be edited. They double check grammar, spelling and help it become more concise. Sometimes, the head copywriter might not like your script, so then you’d have to go back to the drawing board and begin from step number 6 of going through your material to rewrite. Maybe it helps I know how to edit videos, but I always sit next to the editor when he's working on my story. This is one way to ensure how you visualize the report, will be how it will actually look as a finished product. You can even make changes and improvements as you move along. It's where all the kinks are ironed out. 11. Final pitch for airing. So you have a finished product, now it needs an airing schedule. A second pitch is done to the news head, if it is within CNN Philippines standards and if it is good enough of a story to air and whether it’s a relevant story at the moment. There are times, changes must be done, or additional interviews are needed, so I'd have to go back to step 1 again and put in place missing elements. Once it gets the final approval, it's good to go and that's how I get my stories aired. Do you write your own story? Yes, I do write my own stories. I wrote one by chance back in October of last year. My family was on vacation in Hong Kong and during the Occupy Central rallies, I decided to film the protests with my smart phone and interview a local. I also managed to convince an OFW to give her thoughts on camera. I didn't have a crew, just myself and my mobile phone to record everything. This was prior to CNN Philippines and any formal training or seminar on TV reporting, but somehow it worked. I wrote a story that was relevant and was of interest to the public. It was titled, "Business As Usual'" and clarified the mistaken belief that a visit to Hong Kong at the time of the rallies was dangerous, because it wasn't. It really only affected the locals who were rallying with other Chinese nationals on the streets. How long does it usually take for you to write? Reviewing material takes 2-4 hours, if you will be very specific and want to make sure you don't miss out on any great shot or interview answer. After that's done, I usually have about 10-15 pages of shots that really stood out and answers that I think are important. Then comes the elimination process. The challenge is cramming many great shots in less than 3 minutes, which is our usual reporting length. Once you have only the really great shots, you take a look at it and then form a piece. I never write a script first, then find video. It seems better to write to your video so you always have the right material to show. This writing process then takes me two hours. What really takes longer is the approval process and video editing. Human interest pieces are easily put on the back burner for what seem to more pressing issues or breaking news, which is understandable. So far what's the most memorable story you have done since joining CNN Philippines? The second story I filed for CNN Philippines was about Lola Peryang and Facebook. She is this old woman, you still see today selling rags in Alabang. I came across this story, looking through Facebook feeds (which means it's a relevant topic, people are currently talking about). I saw it shared by a friend, and looked for the account of the original post. I messaged her, and pitched a report and sought for her help in interviewing the old lady. That report aired on Headline News, and when I came in to work in the afternoon, I was told someone had dropped off donations, bags of groceries for the old lady on Facebook. This person saw my report and felt the drive to go to the network to bring good will. Our then-VP of News and Current Affairs, Ferdie Aboga told me, "You have the power to make people feel." I think that started it for me. I decided then, this was what I wanted to do. The world is filled with so much war, death and destruction, but if I can do my part in helping make people "feel" so that they are kinder and nicer to others, then that would be my mission as a journalist. Recent ones I’m proud to have filed are "Coping With Cerebral Palsy," "Redefining Beauty Through Miss Possibilities," and "Teaching Against All Odds." These were stories of people who normally don’t get heard, but is important for society to be reminded of. I believe it could help open people’s minds so there can be less stereotypes, stigma and wrong notions when it comes to people with disabilities. Tell us about your experience writing for a digital publication, AutoIndustriya. What did you learn from that experience? That was an amazing experience. I felt very lucky. My then co-radio DJ Eric Tipan, asked me if I wanted to write about cars. I had to be honest and say, I don't know much about cars, except how to drive it. He then suggested I contribute car reviews based on me being a female, and with a baby. That made sense. Many women drive but don't really care about what's under the hood. So I became the first female contributing writer for the publication (on March 2013, Women's Month, nonetheless!) I wrote articles other women can relate to about cars. Best part of the job, was getting a car delivered to your home with a full tank of gas that you drive around and use for a week up to a month, and then you write a review on it. It was an awesome job. But I chose to end it when I focused on serious journalism for CNN Philippines. How about your experience at Jam88.3 FM? What did you learn from your 4-year stint that made you the broadcaster that you are today? In the studio, we have a floor director, a cameraman, an assistant. In the newsroom, you have the researchers, the writers, the producers. In the control room, you've got the spinners, the sound technicians etc. In radio, all of that is the DJ. Well, at least at the stations I've worked at and especially for prime time slots which are the busiest. I've interviewed many people who likened me to an octopus, shocked that I was doing everything myself. Lining up of songs, commercials, answering phone calls from listeners, tweeting, posting on Facebook, controlling the board, researching what to say, interviewing guests and talking. I credit this hyper multi-tasking experience to my enjoyment of filing special reports, where I take on many tasks on the field to come up with what I'd like to think is quality reporting. For my radio show, The Daily Stew, I ran at one point 10 segments a day, and would research on these topics of interest, put together a basic script, then ad lib most of the way. There's a difference with reading and just speaking. Problem is, extemporaneous speaking is not a skill easily acquired. But if you want your listeners to really be engaged they have to know you're not just reading. That's how you gain respect and create a voice of authority in the topic. So, I’d like to think this experience has given me some speaking skills when interviewing and doing my recaps after breaking news and interviews which is done without a prompter or script. I've interviewed people I had no background on, who just arrived at the station for a guesting. Sometimes coordination doesn't happen and the DJ will have to just wing it. I've learned interviews shouldn’t sound like an interrogation, but a conversation if you really want to be able to get the truth from the person. Field reporting is something actually many DJs already do. You're sent off to a place, to observe, discover the situation and report on it live to the radio DJ on board. Sometimes you interview people as well during these live reports. It's pretty much the same thing in TV field reporting, except instead of covering concerts and events, you cover press briefings, or rallies. It can just be as loud and as busy but you, the reporter must still be able to focus amidst all the chaos and deliver your report in a clear, understandable and concise manner. Same situations, same goals, just a different subject matter. You were able to wear many hats at PTV4 — reporter/writer/producer/director/editor — when you joined the network in 2012. What did you learn from that experience? I learned that being a content provider with the responsibility of submitting 3-4 minute video reports in English and 3 in Filipino is definitely not easy. But it did help me understand that it can be done. I attended events to cover, filmed with a tripod, had to press the 'recording' button myself. Then I'd come home, look at the material, edit the video, voice it in Filipino and English and submit to the boss (at that time Ed Finlan), who hired me.I enjoyed the creativity aspect of the task but it was very tedious. It did force me to learn how to use a video editing software called Adobe Premier. Did you ever imagine that you would be returning to broadcast news just two years after leaving PTV4? Not really. I wanted to further enhance my writing skills, but after applying as a writer at Solar, I was asked to audition as an anchor. That's how I ended up returning to the industry. So how did you hear about the Solar News gig? Three months after giving birth, I was thinking about my future as a parent and went online to search for more jobs to take on aside from my radio show. I saw a job advert for a news writer. I applied for that, and luckily for me, they were in need of anchors and so I was asked if I'd be interested to audition, and I did. Tell us about your stint at Koozzoo Media. During my tenure as a DJ, I would collect as many jobs as possible. One, it paid rent and my food. Secondly, because a radio job is really just 3 hours daily, so I craved to continuously seek opportunities where I get to learn at the same time make money. I was recommended by a friend to try and be a presenter for Koozzoo Media in Makati. I got the job and was trained by the owner, an Australian businessman, Victor Altomare, on the art of professional presenting. He taught me how to use my voice effectively when reading and how to use my hands to convey a message when presenting. I presented on video Australian properties for sale, as well as powerful political commentaries he had written for me to deliver with as much impact concerning Australia's most pressing issues. You were able to work in a government-owned station, FM radio, and now at a localized CNN station. How do they compare from your own career standpoint? There are many similarities, only the names and situations are different. I produced my own lifestyle reports for PTV4 and only came to work to submit my finished videos. So most of the time I was out filming, covering events, or at home video editing and writing. I had my radio job during this time as well, so it was very busy. Working for an FM radio station is very similar to a localized TV network, except radio doesn't have as much budget as TV so we are expected to do the work of 10 people for the job. Why do DJs do it? Because, let's face it, playing music and speaking your thoughts is a fun job. Pertaining to CNN Philippines, I am well aware there are many areas for improvement. But hopefully, the audience will also remember, it's a very new franchise of the brand, and with anything new, there will be many things to learn along the way. Prior to joining broadcast news, were you a news junkie? In 1991, the Gulf War happened. I was then in the Middle East where my father worked for years as a naval insurance expert. When other nationals fled to seek safety in their own countries, we stayed behind. My dad was needed in case ships would get bombed or destroyed. For almost a year, school was suspended. We remained indoors with a room full of canned goods, gallons and gallons of water and CNN on TV 24 hours a day. Time to go to bed? Well, CNN would still be in the background. We needed to do this to know if we were going to be bombed and would have to grab our gas masks and head out of the building to seek cover. CNN at the time was the only media outlet able to report directly from the heart of the battlefield, and I spent that entire year watching the news and breathing it. Perhaps initially out of necessity, but eventually I began to admire the reporters' courage in being amidst danger. I emulated how the news presenters spoke and would practice reading the paper in front of a mirror imagining I was a news anchor reading something very important that people needed to know about. Being a news junkie came into my life at an early age unexpectedly, so this is a dream what I am doing now. To be a reporter and anchor for CNN, in this case Philippines. Who in the industry do you admire and why? I really admire Anna Coren. When she reports you can see she gets immersed in her stories and because she does she is able to convey those sincere emotions to her audience as well, and we feel it. It's truly a gift, but a gift that requires much sincerity or people won't care. Her stories always manage to bring about emotions of shock, joy or sadness. It made me want to focus on those stories, stories that made people 'feel', because when they do, it could influence their actions and thereby, even just for a tiny bit can perhaps influence society as a whole. I take a lot of quirky elements from Richard Quest and Andrew Stevens files quite unique reports as well, so I always keep them in mind when filing mine. Investigative journalist Ross McLaughlin's short stay at CNN Philippines this year taught me much of the technical aspect of the writing process. His passion and energy was highly infectious! After having sessions with him I was itching to just keep producing reports. Anderson Cooper is another idol, he has conducted amazing interviews and always portrays a dignified, yet down-to-earth persona in the field and in the studio. And of course, who will argue with me that the beautiful Kristie Lu Stout isn't the whole package. Someone away from the spotlight has been mentoring my reporting and news anchoring, Allen Shum has been with CNN for over a decade and has an encyclopedia of expertise in the industry. I have been lucky enough to get mentored under his wing during his frequent visits in the country. Locally, it would have to be Maria Ressa and what she has done with Rappler. It's genius! We are a society who are now on our smart phones all day long and we want constant interaction within the comforts of our home, the office etc. Her emphasis on social media engagement is truly a step towards the future. Looking back at your career, what were some of the biggest lessons you have learned? If I were a map, my career's path is definitely not a straight line. It's filled with detours, but what I have really learned is that each one of those alternate routes had a purpose. It had a goal, so I can learn more not just about my craft, but about myself as a human being. I've learned when the moment feels right, make that turn. I learned not to be afraid of an unknown path, but to go forth and take on the challenge. Will I do well? Will I like it? Is it the right choice for me? I don't know. But there's only one way to find out. So go for it. What do you consider your biggest success, both in your personal and professional life? My biggest success in my personal life is my family. I grew up an only child, traveling a lot and moving from place to place with my parents so I would make friends and then have to say goodbye all over again. It can be lonely. So, my family now, my husband and my baby, they are my encouragement that no matter if I need to say goodbye to friends or to a career or a hobby that they will be with be by my side. Professionally, I'd have to say it's proving to myself over and over again, with the many jobs and careers I've taken on, that anything is possible. Your goals and dreams can be achieved, if you have enough passion and determination to reach it. Sometimes, the challenge in knowing that anything is possible, is having to ask yourself, 'Now I've achieved this, what more can I achieve? What else is there out there that I can also do?' I've been called an overachiever by many of my friends, but I like to think of it as simply knowing anything can be possible, truly believing in it and making things happen. I wake up, go to the gym, make breakfast, catch up on the news, make lunch, quality time with my baby, then during his nap, do a mix of these random activities : watch movies, play guitar, draw, write, research for work, then prepare dinner, spend time with my husband talking about our day and plans and then try to relax unless we are meeting up with friends to catch up. Tell us about your family. How do you manage to find time for them? I have a two-year-old baby, his name is RedD Rocket, so when we meet people, sometimes they'll forget my husband and I, but they'll remember a baby called RedD Rocket! My husband studied architecture in the US, but he has chosen not to practice it for now and currently can work from any location as a digital marketer. Prior to Solar transitioning to CNN Philippines, my schedule was jam packed. I'd have my radio show, Solar newscasting, events hosting, driving new cars around town for review articles. Since under CNN Philippines' watch, and being exclusive, I've actually had more time to spend with my family, although one thing we cannot do much of these days is travel. What's your hope for the future? My hope for the future is to become a truly wise person who has acquired the skills and experience that can be put together in one unified endeavor. 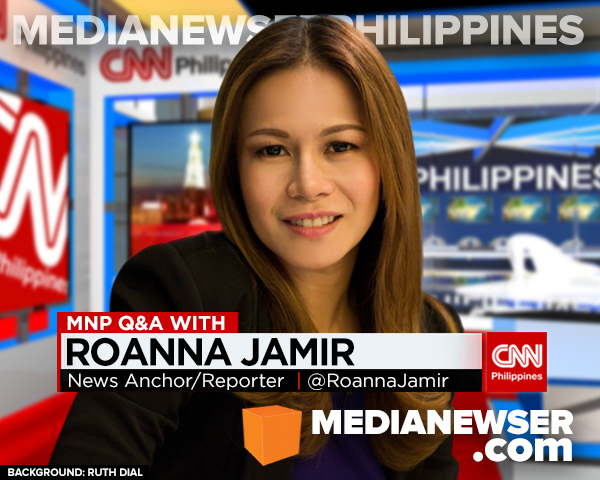 What do you think our readers should know more about Roanna Jamir? With my suits at work and the coiffed hair and make up, most might not realize I have many tattoos. I cover them up so I don't get pre-judged into a negative stereotype, but thankfully, I've discovered, when people find out my arms are filled with tattoos, they don't see it as a negative trait. I’d like to believe it’s because I managed to first gain their respect, so the tattoos don’t matter. I'm a free spirit, who enjoys the arts, music and culture. I believe every person is kind, just hardened because of a series of traumatic experiences. I am compelled to live my life with as much positivity and love for all. And many times, I get very affected by the death and destruction I report on and can get emotional about it. It's my weakness in this industry. Perhaps I'm just a hippie at heart and just want the world to be filled with peace, love and light. Finally, what's the best advice you can give to those who might want to join the industry? On the other hand, a degree does not guarantee a successful career either. It will still take much work to gain credibility and respect of your peers and audience. If you will be an on-camera professional as a reporter or news anchor, what I can say is that you will always be in the public's eye. Everything you say or do can and will be criticized. You are the frontliners of the industry. Make people want to look up to you by showing a good example of professionalism and character at all times. Be sincere about it, people are very smart and can smell fraud. It's a lifelong commitment. Try not to get upset when you are critiqued. Listen to the criticism and see how you can change your attitude about it and improve your performance at work so people will find it difficult to say anything negative about you. Push yourself to be the best you can be, while at the same time, helping others at work reach their goals. Always remember, you're only as good as your last report, so keep doing better than you did yesterday and keep in mind, you are always going to be a work-in-progress.